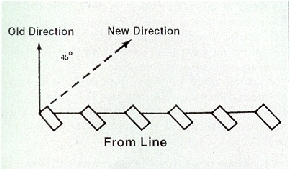 To change the line of march for a short distance but not the direction, the command is Right (Left) Oblique, MARCH. To maintain alignment while in the Oblique, the base for the movement is the extreme right or left file which has been designated by the command. Members of the formation will keep their shoulders parallel to the base and regulate their steps so that the ranks remain parallel to the original front. The word oblique is pronounced to rhyme with strike. Right Oblique: The command Right Oblique, MARCH is given while marching at a quick time. The command of execution will be given as the right foot strikes the ground, as this involves a movement to the right. At the command of execution, your next step would be one more 30" step to the front with your left foot. Your next step would be to face 45 degrees to the right by pivoting on the ball of the left foot and, at the same time, take a 30" step in the oblique with your right foot. During the execution of this movement, the arms will continue their swing but will not be allowed to swing wide from the body. Continue to march in the right oblique until given another command. Left Oblique: This movement is executed in the same manner to the left by substituting the words Left for Right where appropriate. (1) Half Step: The purpose of this movement is to slow the forward movement but not the cadence. Assume you are marching in the oblique and you receive the command Half Step, MARCH. The command of execution may be given as either foot strikes the deck. Half Step, MARCH. At the command of execution, MARCH, your next step would be one more 30" step in the oblique with your left/right foot. The next step will be a 15" half step with the right/left foot. Continue to march in the oblique until given another command. The only command you may receive while half stepping in the oblique is Resume, MARCH. The command of execution will be given as the left foot strikes the deck. At the command of execution, your next step will be one more 15" step in the oblique with your right foot. Your next step will be a 30" step in the oblique with your left foot. Continue to march in the oblique until given another command. 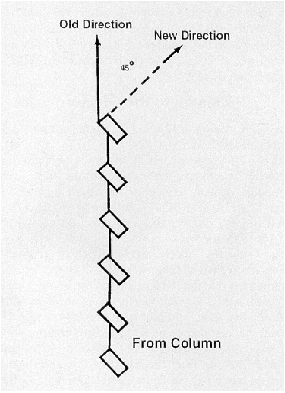 (2) Mark Time: While marching in the oblique and you receive the command Mark Time, MARCH. The command of execution may be given as either foot strikes the deck. The purpose of this movement is to stop the forward movement but not the cadence. For this example MARCH is given on the left foot. At the command of execution, MARCH, your next step will be one more 30" step in the oblique with your right foot. Your next step would be to drive the left foot forward along the right foot with a straight left knee as in halting. You would then begin marking time with your right foot by raising the toe 2" and the heel 4" off the deck. Continue to mark time until given another command. The only command you may receive while marking time in the oblique is Resume, MARCH. The command of execution will be given as the left foot strikes the deck. At the command of execution, your next step would be one more 2" vertical step in place with your right foot. Your next step would be a 30" step in the oblique with your left foot. Continue to march in the oblique until given another command. (3) In Place Halt: The command is In Place, HALT. The purpose of this movement is to halt the platoon in the oblique. The command of execution may be given as either foot strikes the deck. For this example HALT is given on the left foot. At the command of execution, and for the 1st count of halt, your next step will be one more 30" step in the oblique with your right foot. For the 2nd count of halt, smartly drive the left heel against the right heel with a straight left knee, assuming the position of attention. The only command you may receive from In Place Halt is Resume MARCH. On the preparatory command, Resume, shift the weight of your body to the right leg without noticeable movement. On the command of execution, MARCH, step off with your left foot a 30' step in the oblique and continue to march until given another command. your right foot. At the same time, smartly bring your left heel against the right heel, assuming the position of attention. 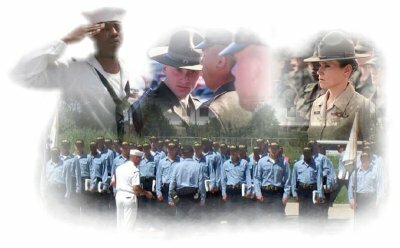 (5) Forward March: The purpose of this movement is to march the unit to its original front. When marching in the right oblique, the command of execution, MARCH, will be given as the left foot strikes the deck. At the command of execution, your next step will be one more 30" step in the oblique with your right foot. Your next step is to face 45 degrees to the left by pivoting on the ball of your right foot. Do not allow the arms to swing wide from the body, but continue their natural swing, and continue to march until given another command. When marching in the left oblique, the command is given on the opposite foot as above.